Diggers Valley: 7 July 2018. The week beginning the 7th of July 2018. 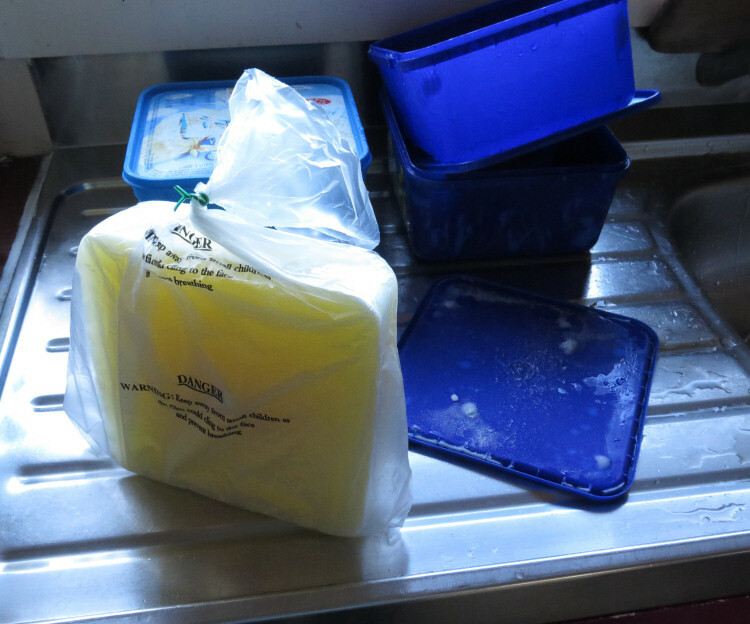 This is part of our morning routine at present: we take three frozen blocks of milk and bag them, then freeze another three lots - probably about 8-900mls per block. Each will keep us going for a day or so during Zella's dry period. Bagging the blocks means they take less room in the ever-more-crowded freezer but is also necessary because we don't have an endless supply of ice-cream containers. Frozen milk from Zella is always better than commercially-produced "fresh" milk from a shop. 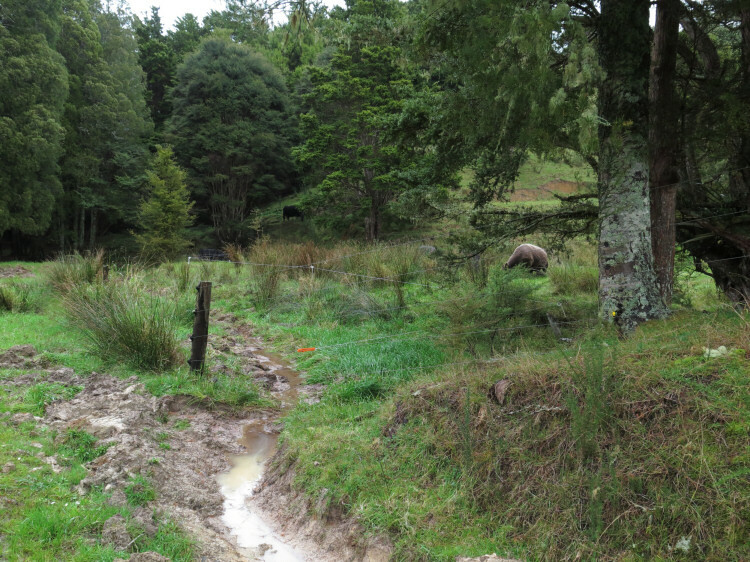 Stephan went weeding this morning, along the stream banks of the Waikawa. There are Privet, Japanese Walnut, Acmena, Wild Ginger, Elephant Ear along with the ever-advancing Tradescantia, about which we can do nothing worthwhile. He cut all those larger plants and painted neat herbicide on their stumps. It's something he's been doing at least annually in recent years, to try and keep some of the pest species under some kind of control. 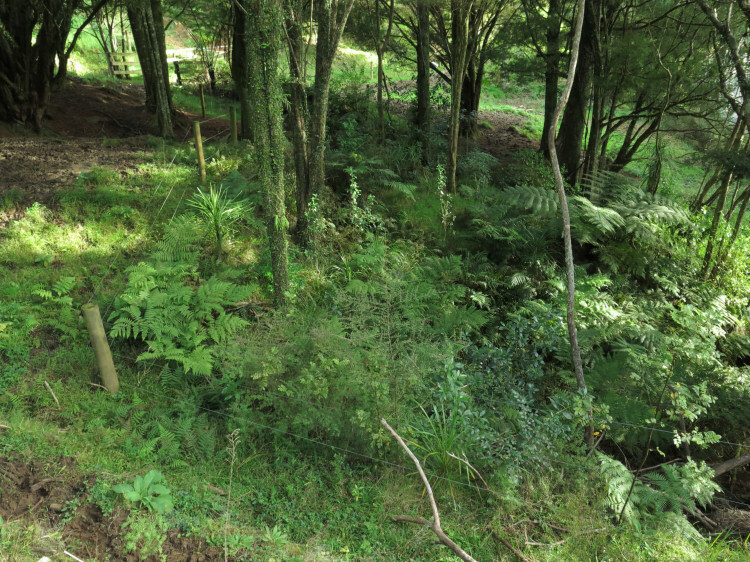 This is a section of the roadside reserve in the smaller part of our Over the Road block. It has been fenced off from the cattle now for nearly four years. I took half a bale of hay out to the young stock this afternoon, the first time some of them have encountered grass in this form. Those who know I'll bring them good things came over quite quickly, including Zoom and Spot, who've been having a bit of hay with their mothers in the last week or two. We went for a walk up the road to visit our new neighbours and see what they're doing on their block of land. On the way home we ducked into the bush where these orchids grow, to see how many I could find and whether or not they were flowering. There were quite a few plants around, some already beginning to bloom. 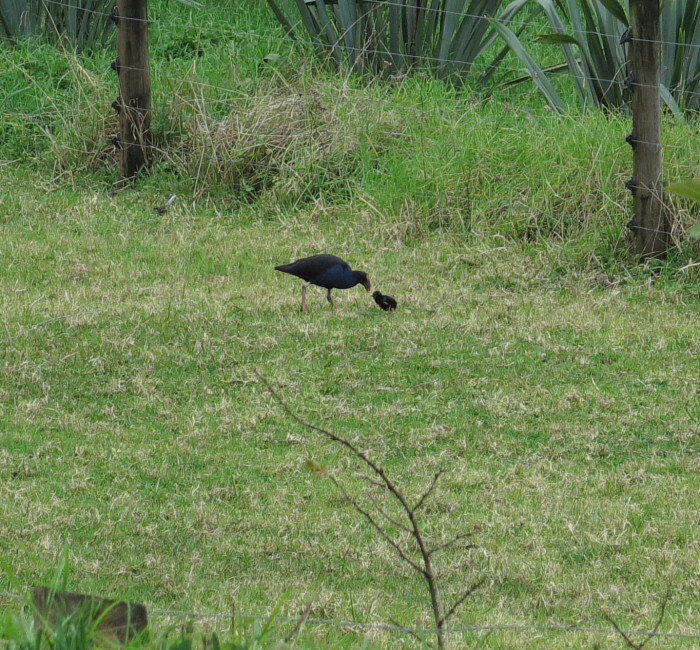 The one remaining Pukeko chick of the latest clutch. There were three but a disturbance late the other night must have been the end of two of them. Something caused them to urgently vacate their nest and either they were subsequently eaten by whatever was hunting them, or they were lost in the dark and cold. I was unable to assist, under attack by their alarmed parents, but hoped my investigation had frightened their predator away. I could only withdraw and hope they all found their way back to safety and warmth. As soon as I shut the cows in the Pines paddock this afternoon, several of them clambered into the wet area to graze the lush grasses there. This is why the newly-cleared drain needed an electric tape around it. On the 17th of March (a date still missing from this record), we picked the orchard fruit and brought home four buckets of apples and pears, two of which were Ballarats, the stewing favourite of my father. This evening I cooked the last of them. It was the end of an experiment to see how long they'd last - I had read that they kept for quite some time. I didn't do anything to keep them in good order and had gone through them whenever we felt like something for dessert, picking out those with surface wounds where brown marks were starting to spread. When they were fresh, they cooked very quickly, fluffing up in the way Ballarats do. As they aged, they took longer to cook. By this evening, the last of the apples were quite soft to squeeze and took a long time to change when cooked although they were just as delicious as ever. More hay for the youngsters. 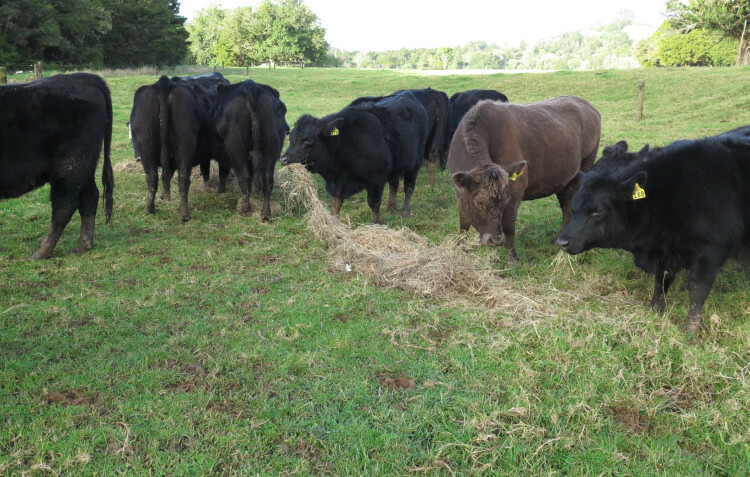 I've been giving it to them on their second day in any grazing area: new grass one day, hay the next. It's fun watching their enjoyment as they feed. Sister Jude rang me today because of the date. We continue to mark the ninth of July each year, the date Father died in 1989. I often think about how our parents kept their own antecedents in their thoughts and conversation and therefore our conciousness as children, so we had a sense of our heritage. We do the same with the four in our following generation too. But for ourselves there's an importance in remembering someone who had such a positive influence in our lives, someone in whom our own identities are anchored. The down-side of not being pregnant: coming on heat every three weeks! I didn't worry when Demelza ended up not being pregnant but watching this carry-on concerns me. She's so stiff in her hind legs that her attempts to mount Zella and Zella's weight on Demelza, are probably not very good for her. She can't help herself. 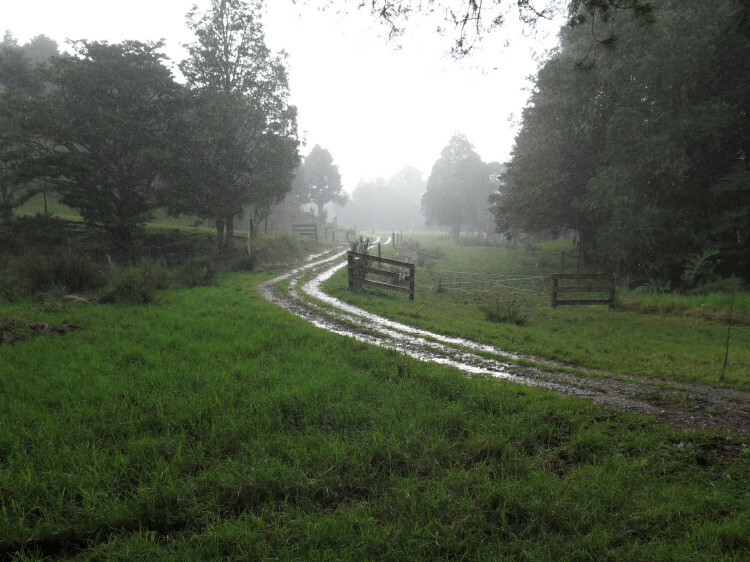 I had gone to check on the cows in the Pines (to the left) and was listening to the long-range weather forecast on the radio. 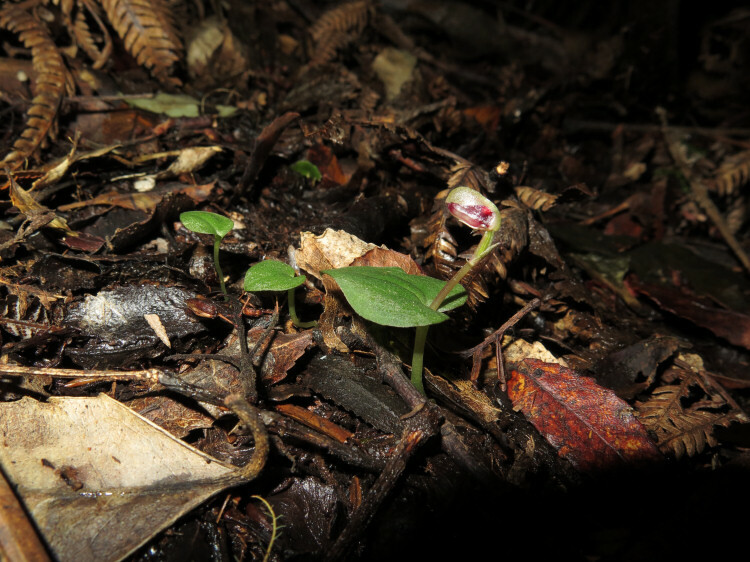 As our area's forecast was announced, including "a few heavy showers with hail", hail started to fall and I had to dash for cover under the big Kahikatea trees as the hailstones bounced around me in the heavy rain. 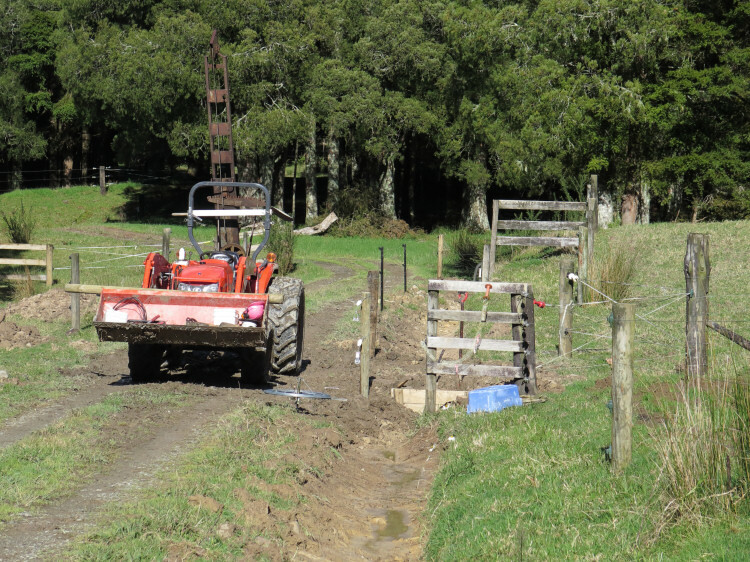 In the afternoon Stephan replaced the tape and standards along this newly-cleared drain with permanent steel standards and a two-wire electric fence. In the right foreground is a rope tied across the gap between rails and the gate-post behind me, in the gateway to Flat 5a. A rope is, in some situations, a sufficient gate when its purpose is merely to direct cattle one way or another. 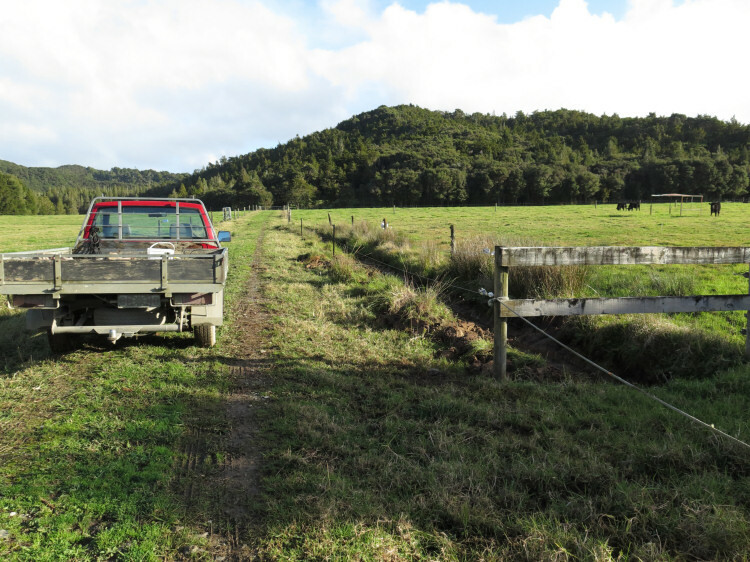 They'd push under or through it if they really wanted to but when I want them to pass this gateway without stopping to graze the little bit of grass there, or wish them to turn into the paddock, the rope can be tied across the lane to indicate that. Most of the cows in the Pines were over the other side of the swamp and came out of the gate there. Three were on this side and the easiest thing to do, since Stephan was there to assist, was to let those three come out through this gate over the new culvert, demonstrating exactly why I'd tried to avoid doing so. 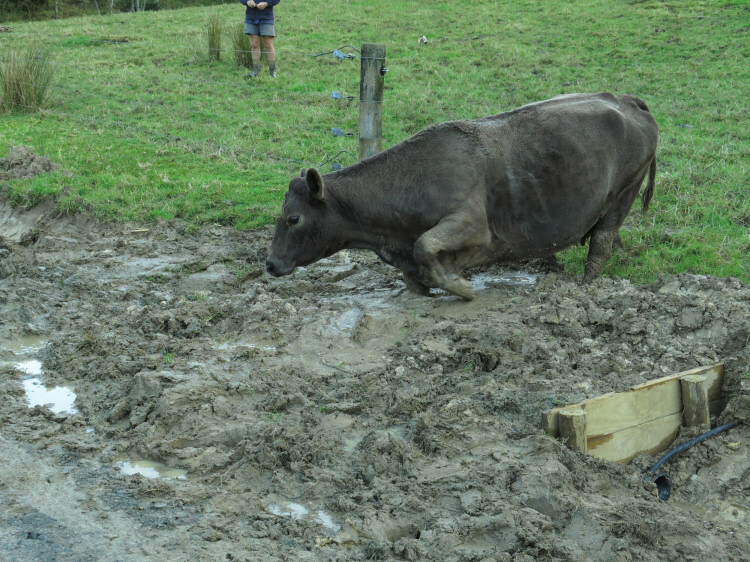 Stephan then used a shovel to fill in the deep holes the cows had made and smoothed the surface so water doesn't pool and keep it all wet and soft. 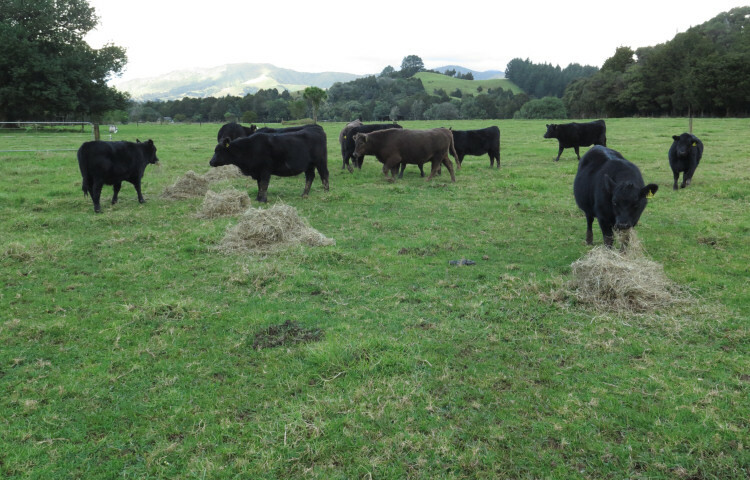 The cows came in to the Small Hill on the right, opposite the 13 youngsters in the Bush Flat. 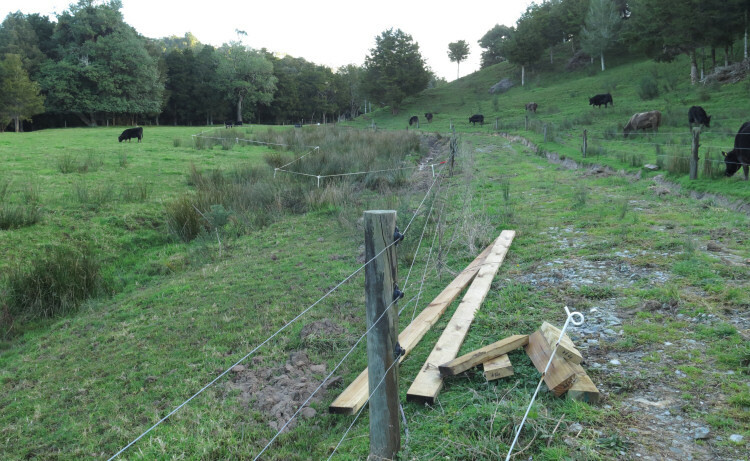 Before I moved the young cattle I erected a tape around the boggy bit of the Bush Flat paddock and the drain Stephan had dug to try and deal with the water there. I was highly amused, when moving the heifers across the stream, to watch Spot make a huge leap to avoid walking through the water. It then occurred to me that this was probably the first time she's ever seen a stream, having spent her whole life so far on the flats. 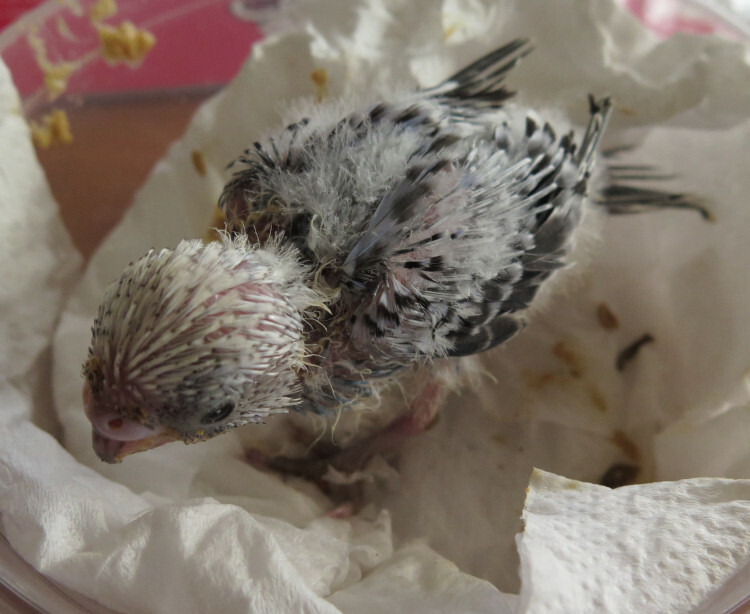 The Budgie chick has been growing feathers, now some blue just starting to come through. I weigh it regularly to check whether it is gaining more weight than it looks like; it isn't. I'm not sure this bird will grow old. I wonder about the slight curve or twist in the feathers at the end of its wings and whether or not they're growing properly. Only time will tell. More drain fencing today, this time around the base of the Pines and PW. Stephan got most of this work done during the day, he told me later, while I stayed home doing preparatory reading and then taking part in a teleconference meeting. Stephan milked Zella for the last time this morning, then, since she has shown signs of increased somatic cell counts in two quarters in the last few weeks, he inserted a dry-cow antibiotic treatment into each teat, followed by a teat sealant product, a new approach for us this year but the "gold standard" for protection during the twelve weeks until next calving. 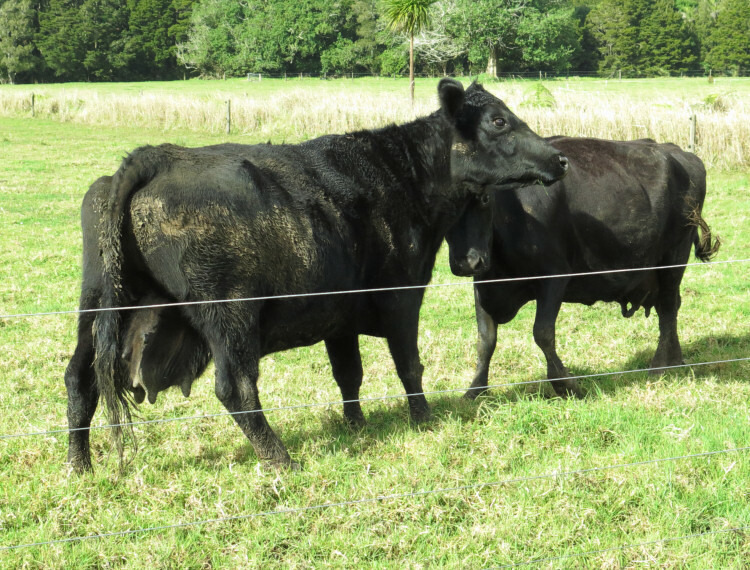 Zella's mastitis issues have caused varying levels of difficulty in recent years. Last season we had to embark on a long period of antibiotic treatment after she became ill from a mastitis infection; this season there has only been the slightest sign of possible infection but I remain cautious. Then we took them to the yards, put them over the scales and, for the first time for several years, put the pour-on drench on Zella's back. With a 91-day withholding period, it's not a treatment I've wanted to use on her very often but I have been concerned that she may be carrying some parasites it would be helpful to eliminate. Zella weighed 556kg and Demelza 612kg. Not really. I went to see a chiropractor. I'm suffering an injury related to a physiotherapy treatment that has not responded to further attempts to fix it and now, in desperation, I'm trying something different. 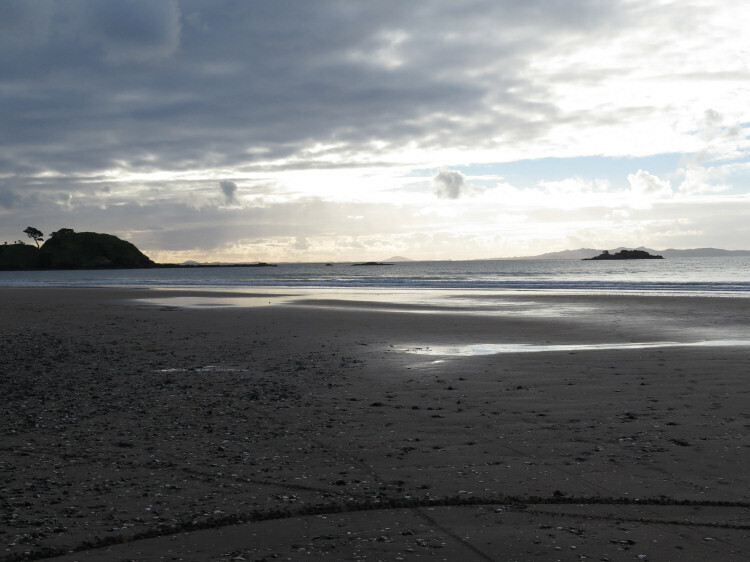 On our way there we had time for a stroll on Coopers Beach. I spent the first years of my life here, living about 100m back from the shore, at Motel Pamir. Somewhere amongst my papers there is a brochure for the Motel from the early 70s, showing two little blond girls and their mother playing in the sand and sunshine, just to the left of this picture. I remember this tree so well from childhood. We walked along looking up into the foliage, trying to find some seed capsules with seeds still in them. I thought we might not be too late in the season and so it proved: I collected a handful of seed pods which then released their fine golden seed into the bottom of my plastic bag. There was no sign of the dreaded Myrtle Rust anywhere. 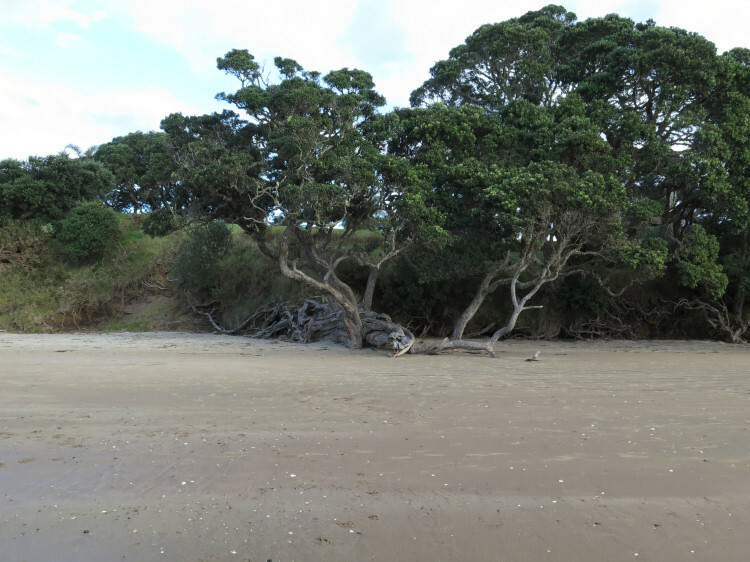 After my treatment we bought fish and chips for tea and drove up to Rangikapiti P&amacr;, the old 'park up' spot for some people when they were teens, where I was disappointed to discover no view down to Mill Bay because there were so many trees where vehicle access is now restricted to the lower slopes. To have gone on anywhere else would have meant cold dinner, so we sat there in our steamy-windowed ute in the dark and ate our dinner.